Now that warm weather is finally here, it's time to flee the kitchen for the comforts of outdoor dining. And what's better to eat on your patio than a juicy burger? 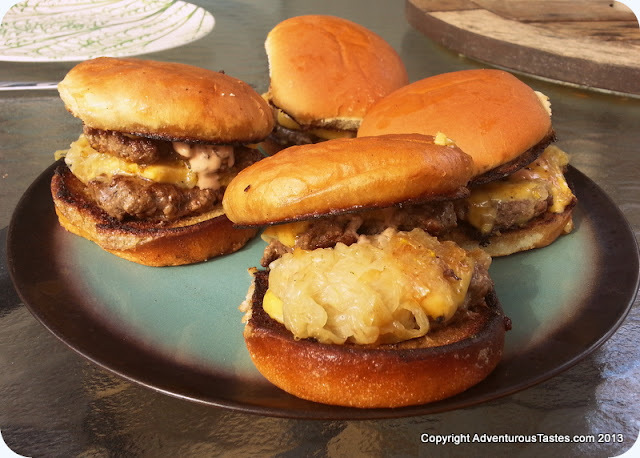 We at Adventurous Tastes love a good burger and have tried a variety of recipes over the years (the ultimate cookout menu, lamb & beef burger, grind-your-own brisket burgers). But I think we might retire other recipes because we have found the definitive cheeseburger. It's so good that we've had it at least 3 times in the last month or so, and the Mr. can't even bear the idea of cooking burgers any other way. This recipe is a copycat of the In-N-Out Double Double Animal Style Burger, courtesy of Buns in My Oven, who in turn based her posting on this thorough experimentation from Serious Eats by J. Kenzi Lopez-Alt . It is in a word, epic. It's nothing fancy, just ground beef, cheese, American cheese, onions and special sauce on a bun. Each bite is a messy, glorious taste sensation. Despite being two patties, I can easily polish off one of these in mere moments. Last time we made them, the Mr. accidentally made the burgers too big, and I still ate it in under 5 minutes. It's just that good. So if you're an east coaster with nary an In-and-Out in sight, fret no more. You too can enjoy the bliss that is an In-N-Out burger from the comfort of your own home. Never experienced In-N-Out? First off, get yourself to the west coast post-haste. When the Mr. and I head to wine country, we always make a pit stop at In-N-Out right after the airport. They have a not-so-secret menu, and one of the options is Animal Style, which include pickles, extra sauce, grilled onions, and mustard fried onto each hamburger patty. This recipe does a pretty darn good job of replicating the original. You can thank me later.